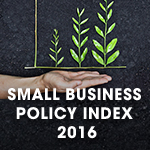 To access the Small Business Policy Index 2016 full report please click here. To learn how each state ranks in this year’s Index, click on a specific state for the findings and a summary of the ranking. To view how each state ranks per selected measurements that are used to quantify the final ranking, please click here. To view the results of Small Business Policy Index 2014, please click here. To view the results of Small Business Policy Index 2013, please click here. To view the results of Small Business Policy Index 2012, please click here.